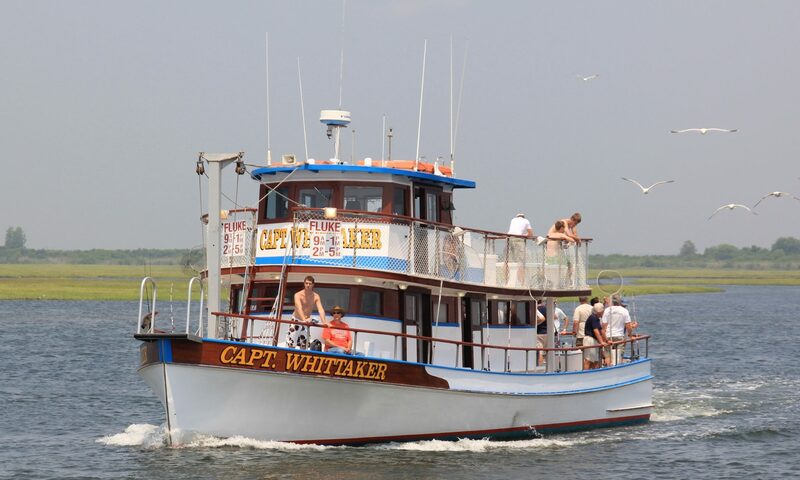 Map and Directions to the Captain Whittaker Fishing Boat. It is a Beautiful Relaxing Ride to the Captree State Park Marina. FROM Suffolk County – take the Robert Moses Causeway South over the 1st Big Bridge, Great South Bay. Drive about a mile to a much Smaller Bridge. Drive Over the Smaller Bridge. Then Exit at the 2nd Right to go East on Ocean Parkway. This Exit is before the 3rd Bridge. Drive East about a 1/4 of a mile and you are at the Entrance Gate to Beautiful Captree State Park. FROM Nassau County, take the Ocean Parkway East from Jones Beach. Drive 12 miles East to the end of Ocean Parkway and you are at Captree State Park. After you drive into the Captree State Park and come out of the traffic circle, make a right turn to the Right Side of the Parking Lot and Park Your Car. We are Located on the Right Side of the Dock as you walk towards the Dock from the Parking Lot.